Between 20% and 25% of American malls will close within five years, according to a new report out this week from Credit Suisse. That kind of plunge would be unprecedented in the nation's history. In 1970 there were only 300 enclosed malls in the U.S., and now there are 1,211 of them. In fact, despite the recent turbulence in the retail industry, the number of malls open has actually edged higher every year. If the analysts at Credit Suisse are right, that trend line about to turn -- sharply -- in the other direction. The reasons are nothing new. People are shopping online more than ever, and that trend is expected to keep growing. Foot traffic at malls has been on the decline for years. The report estimates that as malls close, online sales will grow from 17% of retail sales today to 35% by 2030.
Credit Suisse estimates that a record 8,600 stores will close this year alone. That's far more than the record 6,200 stores that closed in 2008, the first year of the Great Recession. 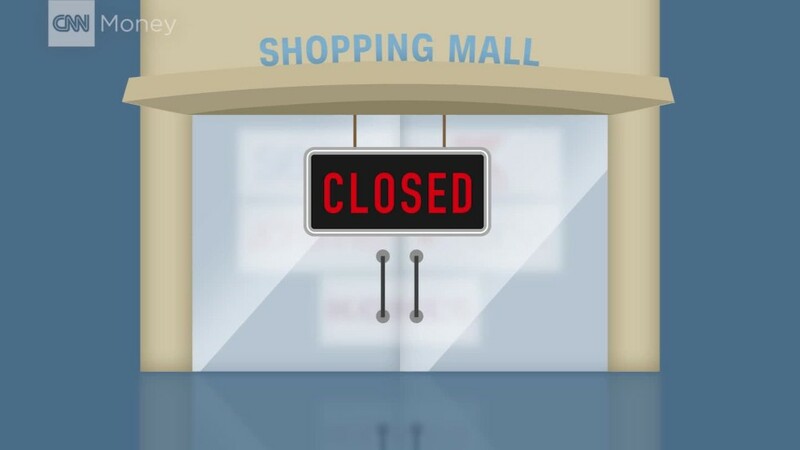 Many department store chains that serve as major anchors of malls are closing wide swaths of stores, including Sears Holdings (SHLD), which is closing 150 of its Sears and Kmart brand stores, JCPenney (JCP), which is shutting 138 stores, and Macy's (M), which is closing 68 stores. And it's not just department stores. Just this week, clothing and accessories retailer Michael Kors (KORS) announced plans to shutter 100 to 125 stores. Not everyone is convinced that these numbers necessarily spell gloom and doom for the industry. "The occupancy rates in this industry are still a very, very healthy 93%," says Tom McGee, CEO of the International Center of Shopping Centers. "That's the ultimate sign of health. Although every store closure is painful, as a percentage of total retail square footage in this country, it's a very small percentage." Even if the way consumers use malls has changed, he said, there's still a need for them. "There clearly is competition that exists today that didn't exist in the past. But I do think the mall is still a social gathering place," McGee adds.